This entry was posted on Thursday, May 11th, 2017 by Frances Ryan. Tomorrow morning, I will start taking a new drug called tolvaptan, which is meant to slow the progression of my kidney disease. When I was first recommended for the drug, I went in search of some user experiences online. But my search didn’t bring up any blog posts or laypersons’ stories and testimonials. So I’ve decided I would get my experiences out there for the next person Googling about tolvaptan and PKD! I will try to share a couple (maybe a few) progress updates, too. All posts related to my experience with tolvaptan will be tagged as such, in addition to my general PKD tag. Tolvaptan is a selective vasopressin V2-receptor antagonist. Which basically means that it reduces the level of the hormone that regulates the balance of water and sodium in your body. It does this by increasing fluid excretion (Reference 1; Reference 2). Remember this for when I talk about the practicalities of the drug later in this post! Can anyone with PKD take tolvaptan? The FDA has now approved tolvaptan for PKD patients in the USA. Read the press release from tolvaptan’s creators and be sure to check out the webinar from PKD Foundation, which includes guidance for help with prescription costs. I hit points 2 and 3. However, it is slightly more complicated than the list. You can view the larger protocol here. People who shouldn’t take tolvaptan are women who are pregnant or trying to get pregnant. First, liver disease. (Sorry to start with the scare-mongering!) A small percentage of people taking tolvaptan (2-3%, on average) will develop abnormal liver tests. If this is going to happen to you, it will happen in the first 12-18 months—hence the monthly blood tests I’ll talk about later in this post. However, if this does happen to you (or to me!) the effects are reversible once you cease taking the drug. What this means is that you will want to drink a lot of water. It seems that “about three litres” is the norm. However, your mileage may vary! That extra drinking will mean that you are taking more trips to the little girls’ room (or gendered/non-gendered room of your choice). Most people I’ve spoken to have indicated that some of these trips are made in the middle of the night. Of the people I’ve spoken to who’ve tried tolvaptan and then stopped, three did so because they did not like the night-time peeing side effect. A fourth person noted that he developed liver function problems. He also noted that his liver tests all returned to normal when he stopped taking the drug. Then there are the drug interactions. This includes grapefruit juice and St John’s Wart, as well as several other prescription drugs. There are also the general warnings for developing weird rashes or other possible adverse effects. So if you do start taking it and become concerned… call your doctor! Better safe than dead! What are the practicalities of taking tolvaptan? Tolvaptan is a twice-daily pill. There are different doses and you are generally started on the lower dose then you move up to a second and third dose as you can tolerate it. Here in Edinburgh, there are monthly clinics that tolvaptan patients attend for the first 18 months. The first couple of visits are with a doctor then visits become just blood work and a possible chat with the nurse or pharmacist. Even then, you see the doctor every six months. The primary reason for these tests is to ensure that your liver tests are all still normal. After 18 months, blood work drops to every three months. This is because you are unlikely to develop liver problems if you haven’t already, so the monthly tests are no longer needed. Here in Scotland at least, there are measures in place to make sure you receive all of the information you need to make an informed decision about the drug. They also provide you with a great deal of easy to read (and comprehend) information to take home. And, of course, I am always happy to answer any questions I can—or to point you in the direction of information when I don’t know the answer. But please do remember the disclaimer at the start and end of this post: I am not a medical professional and nothing I say should be taken as medical advice. Yes, I am nearly a doctor… but not that kind of doctor! 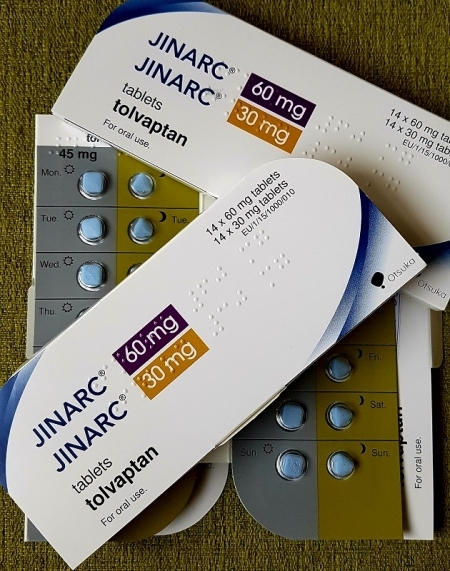 Sometime after I have done my first monthly check up, I will share a bit more about my individual experience of taking tolvaptan. I will try to share with you how much fluid I drink… and how often I need to get rid of it! And hopefully, sharing my experiences will help someone else to make decisions for their own health down the line! If you want to add your own experiences (or ask questions) please feel free to do so in the comments below or privately through my contact form. This post may be updated as I gain more information so please feel free to make relevant suggestions for updates, too. Really interested to hear about your experience and thank you for sharing with us. I’m also due to start on Tolvaptan soon so this is all very new to me too. Hi, Sara. Thank you for the comment! Yesterday was my first day on tolvaptan so I don’t know how good/bad it will actually be. I’m taking notes so that I can share a fairly in-depth experience of the first month - which will hopefully help others! I have PKD, stage 3, and next thrusday I will see my doctor were in Portugal and talk about tolvaptan! I dont know if is avaiable in my country. I Hope everithing goes well with your treatment. Hi, CM. Thank you for your message. The European Commission approved tolvaptan for use in the EU back in 2015. So hopefully the health board in Portugal has approved it for use, too. Let me know what your doctor says. It would be great to know whether tolvaptan is available there and if you are lucky enough to get to try it. Hi Frances, I also attend the ERI, I started on Tolvaptan in February, I’m on the maximum dose now, I was drinking around 10 litres a day but it has calmed down now and I have between 4/6 litres now, and I’m only occasionally up during the night, so it’s all good so far. Wow! It sounds like you’re on the rough side of the side effect spectrum - especially compared to Lisa’s comment following yours! It sounds like you have a positive attitude about it all though, which is probably a big help. I’ll be sure to update after my next appointment (second week of June) and hopefully, I’ll have happy news! I’m pleased to hear that you’re managing well on the full dose. I have been hoping that side effects might calm down as my body gets used to the drug (it certainly did for the starter dose) and your comment encourages me! Thanks for your note. I know that tolvaptan hasn’t been approved in the states (yet) but it’s still worth mentioning your interest to your doctor. That way, when it is finally approved, they will know you’re keen and hopefully get you started on it as soon as possible. My family are all back in America and I’m hoping my nieces and nephews who are affected my PKD will be able to access tolvaptan soon! Tomorrow marks two weeks on tolvaptan for me. So far, so good - and the side effects have been almost unnoticeable since half-way through the first week. But I will be increasing my dose the following day, so I expect that the side effects will increase, too. I will share a full update after my first month’s labs are done in early June. Hi Frances, I started on the highest dose of tolvaptan back in 2008 and I’m still in stage 2 and my creative has stayed the same. I’ve heard that tolvaptan may be getting FDA approved imminently ( let’s hope that this is indeed true) here in the states. It’s already approved but not for PKD. Hi, Diego. Thank you for your message. It really is a shame that certain countries and populations are priced out of some of these life-saving and life-prolonging drugs. I hope you have success in getting tolvaptan in India. Please do keep me posted on your progress! Hello, Jenny! Thanks for reaching out. Were you on the tolvaptan trials then? What happens when the trail ends? It would be a shame if you have to stop the medication whilst waiting for FDA approval. I found it interesting that you are craving sweeter drinks. I have been a huge peppermint tea drinker for a few years now and drink it hot or cold. It’s not sweet, but it has a nice mouth feel. However, I have found that the tea is no longer enough to quench my thirst. Instead, I am really craving plain water! I usually only crave water after a run - so I suppose there must be a dehydration aspect to it all. Jenny, you participated in the Otsuka study, or how did you got your tolvaptan starting in 2008? I started in a trial at the Mayo Clinic in 2008 -2011. Then started up again in 2016 ( they let me start up again since I had already been exposed to the drug). I’m in the highest dose. I love crushed ice and ice water but otherwise—it’s very easy for me to be on the drug. My understanding is that if it is FDA approved, I may still get it at no cost. I hope that it happens—it would be wonderful! Jenny, a couple questions: What is the highest dose, how much are you taking? Another question, you say your creatinine levels where the same while you took it, and at stage 2. Did those levels change between 2011 and 2016 (I belive you said you quit taking it in that period)? Also, before you started in 2008, did your creatinine levels where decaying, and stopped decaying when you started tolvaptan? this can be off-list if you think that is better: do you have access to any information about the experiences of patients ordering Tolvaptan or the generic equivalent from India? Tolvaptan has proven to slow disease progression and it is a shame that approval has been delayed in parts of the industrialized world. Is it safe to order the drug from Indian online pharmacies until it is approved by the FDA? I know that people do access generic equivalents from India (and potentially other places) but I do not know the details of that. I do know that, personally, I would steer clear of medications that do not have a clear and safe provenance or that might be contrary to local laws. And I cannot personally recommend those things, either. A VERY IMPORTANT thing to keep in mind with tolvaptan (or its generic counterparts) is that there is a risk of LIVER DAMAGE. That risk is real and that is why the drug is under tight controls that include regular (monthly for the first 12-18 months) blood checks to monitor liver functions. If you are self-treating with medications purchased from abroad, you will not have the oversight of a medical team who can monitor the drug’s effects on your body. So, ultimately, I would say it is UNSAFE—even if the medication is all above board and safe when used under medical supervision. I am glad to see that someone has started talking about taking tolvaptan! I am the only patient I know of where I live in Canada that is currently taking the medication. Today was my first day taking the medication and man, they weren’t kidding about having to pee and being thirsty! I work as an Operating Room nurse so it was pretty disrupting to my work day, so only time will tell if it gets better! Prolonging my kidney health is important but I have to work too! Hopefully I will be able to do both! I do look forward to more updates from others taking the medication! Thank you so much for reaching out. It is always nice to hear from other tolvaptan takers! It really does get easier as you get used to the medication, so hopefully, you’ll manage to figure out a way to balance the medication’s side effects with the demands of your job. I am an academic, sitting in an office most of the day, so it’s a bit easier for me. But when I’m teaching or delivering a presentation at a conference, there is a real need to plan out my days so that I don’t get caught needing the loo at an inopportune time! There is a really great “tolvaptan community” on Facebook that I am a member of. It is mostly UK-based people, but there are more and more Canadians joining every day. It might be something you want to check out as a good way of connecting with others. I also have a couple of other posts about the day-to-day experiences of taking tolvaptan—all tagged as “tolvaptan”. There is a one-month and four-month review right now, and I will be sharing my experiences at my one-year mark and again about running with tolvaptan in the next wee while. They might be helpful to you, too. I hope you have the best of luck with tolvaptan! !